Congratulations to HanneA who has won a 15 ml bottle of En Voyage Perfumes The 7% Solution! To claim your prize, provide your full name and address to thescentedhound@gmail.com by midnight EST October 31, 2017. Otherwise this incredible prize will go to the next person on the list chosen by random.org. Thank you for all who participated and thank you to En Voyage Perfumes and Shelley Waddington for making this draw possible! Categories: En Voyage Perfumes | Tags: En Voyage Perfumes, fragrance, Perfume | Permalink. WHAT I SMELL: Frida’s opening is wonderfully minty and fruity and the perfume feels like a cornucopia of fruit on a carved out watermelon on a beautiful summertime al fresco dinner party table. It’s juicy, a little spicy and rather snappy. There’s also an energy in the opening as if a bee is buzzing around all of the juicy goodness and as it lands on various fruits, it carries the juice from one gorgeous and ripe fruit to another. After around fifteen minutes, the fruit starts to make way for an indolic tuberose. It’s thick, spicy and incredibly intoxicating. But just as soon as the spiced tuberose starts to dominate, the other florals begin to take over evening out the sharper edges. At this point, Frida is pure loveliness, its bright, soft, tender, but not demure as there’s a projection that is quite large, but the perfume at this point is radiant and full of life. After the 30 minute mark, the tuberose starts to make its way to the center and once again, the perfume begins to become more spicy with a haze of incense hanging over the florals. In the end, Frida leaves you with a lush, fruitful and floral bounty of beauty that I have the feeling will reveal different nuances depending the person’s skin. Whatever is revealed, I guarantee you won’t be disappointed. 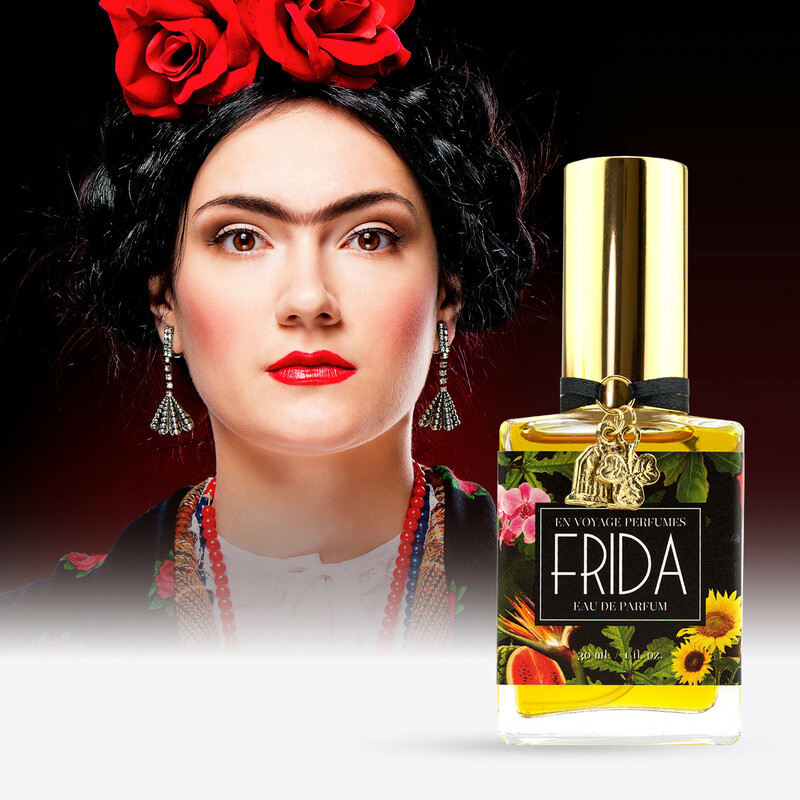 This perfume celebrates the life of Frida Kahlo; the woman and artist, her suffering, her Mexican heritage and her love of nature. Tuberose, a flower that the Aztecs called the Boneflower, is an important note in this perfume as an homage to Frida’s brutal calamities and artistic transformation. Other notes include the hibiscus that she wore in her hair as well as the tropical blossoms and plants of Frida’s garden. The fragrance also devotes close attention to other details of Frida’s life, such as the heat of her native Mexico City, the smells of her cigarettes and her heavy hair. 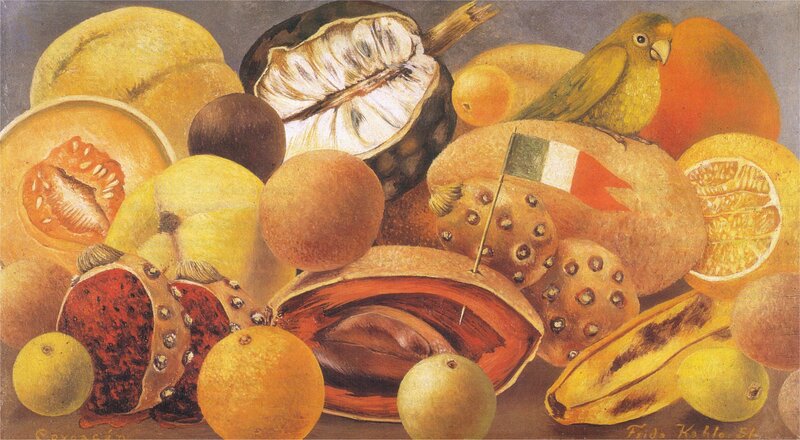 WHAT IT SMELLS LIKE TO ME: A Frida Kahlo still life painting; except there is nothing “still” about her work. BOTTOM LINE: There is something for everyone with Frida; a little fruit, beautiful florals and just a hint of wood and some wonderful spice make this a beautiful celebration of the one and only Frida Kahlo. Categories: En Voyage Perfumes | Tags: 3 bones, eau de parfum, EDP, En Voyage Perfumes, floral, fragrance, Frida, Frida Kahlo, parfum, Perfume, Perfume Review, review, unisex | Permalink.